The TaylorMade RocketBallz Tour Driver features a 460cc titanium head. The Flight Control Technology (FCT) allows the player to easily adjust loft (+/- 1.5) degrees and the face angle (+/- 3) degrees. The tour model is engineered with a smaller address size for a penetrating trajectory and neutral-flight bias with heavier/stiffer shaft for more stability. Thick-Thin Crown design creates lower CG to promote higher launch for more distance. Speed-enhancing head aerodynamics promotes faster head speed for more distance and slime green accents throughout the club provide a unique look. Inverted Cone clubface technology promotes more speed and distance on off-center hits. The white crown and black face makes alignment easy and eliminates glare from the top of the club. 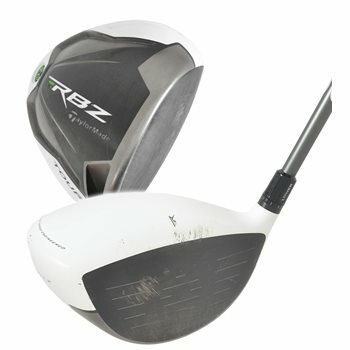 The TP offers a the same head has the Rocketballz Tour but with a upgraded shaft. Can you switch the shaft to the same flex one on the righty from the lefty club? We cannot switch out shafts from one club to another to make a sale. Sorry.